playing with the time system and the day/night pallets in a hack, theoretically would it be possible to implement seasons if you worked around the whole time system? like instead of just having a clock you could add months to it,dependent on the month you could have a different set pallet for the OW creating a way of adding seasons? then dependant on what month you have the clock set too it would show a different set ow pallet by changing the same way it would day/night? then you would have to keep in mind day/night for all the pallets so that would basicially be 12 different ow pallets (spring-day/night summer-day/night winter-day/night autumn-day/night) is there enough free space ingame for this? 12. There is a morning pallet as well. The RTC system for GB cartridges has the capability of storing 511 different days (and on top of this has a carry bit for when this overflows), so it's certainly possible to keep track of months and years accurately, as long as you fire up the game at least every 1023 days. reason being i brung up the idea for an idea for polished crystal and any hack i may make. though if i was going to do this on a vanilla version of pokecrystal i would have to figure out how, but thanks for the replies. 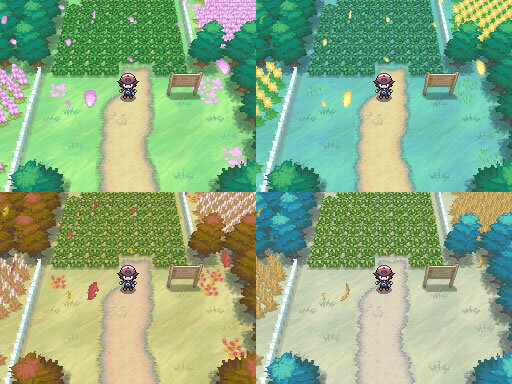 Wouldn't it make more sense to simply load different maps for different seasons to allow more major changes? Or would that be overkill? 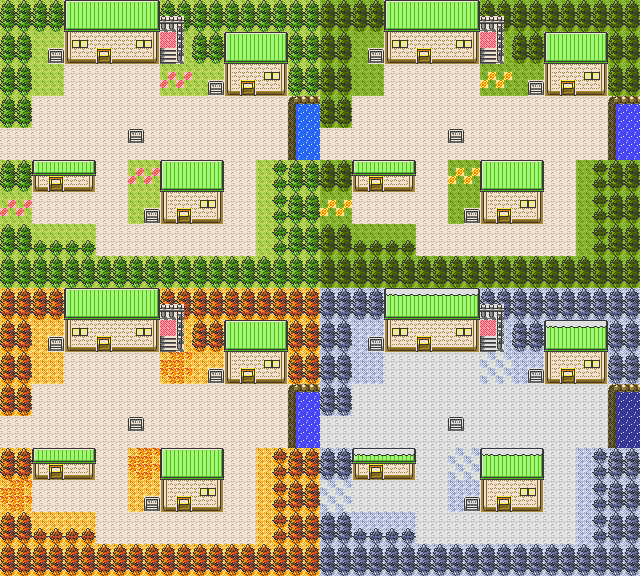 if anyone could setup a tutorial, i kinda want to implement this into a vanilla version of crystal and see where it goes, i also dont really know how to make the tilesets or inserting them. its kinda asking for alot but it would be pretty cool just to do this. also add seasonal pokemon for different times. if you,rangi, and anyone else want to help i kinda want to implement this into a vanilla crystal. if you guys are free, its not a top priority thing but could be added to others hacks too! I apologize if this comes off as rude, but if you'd like to see seasons done as badly as it seems you do, it would be best if you did the legwork and got the ball rolling. Perhaps others would be interested in joining in after you've already gotten some things done. As you said, this is asking for a lot. A large-scale project like this would definitely be appreciated by others if it came to fruition, but as you also said, it's not a priority for most people. You are most likely the one who most wants to see this as a thing; the fastest way to see it completed is to take the initiative and learn the skills needed to do it, rather than ask and wait for others to walk you along the way. I again apologize if I've come off as rude with this post, I merely think taking direct action would be the best choice you could make if you want to see seasons in GSC.